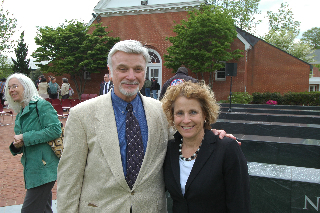 [caption id="attachment_1118" align="alignright" width="300" caption="NCL's Sally Greenberg with Cecil Roberts, President of the United Mine Workers, on April 28 at the National LAbor College Dedication for Fallen Workers Injured on the job."] [/caption] By Sally Greenberg, NCL Executive Director More than 5,000 workers die each year on the job – that’s 14 deaths each day of the year. Most of these tragic deaths can be avoided. Now we have a memorial that pays tribute to the fallen worker. At a ceremony at the National Labor College earlier this week, this memorial was dedicated. As we walked in, a delegate from the Maryland State legislature introduced herself – she said “I’m here for personal reasons. My dad was injured as a laborer on the job, and though he could still work at other things, he was never really happy at the site from there on in.” At the official dedication, three other very compelling people spoke – Liz Shuler, Secretary Treasurer of the AFLCIO, David Michaels, the new director of OSHA, and Cecil Roberts, President of the United Mine Workers. Shuler and Michaels made it personal – they each talked about how every worksite death affects families and communities and leaves behind mourning children and spouses whose lives will be changed unalterably. Cecil Roberts got up and began to speak about workers the way a preacher speaks about God. The audience was spellbound. “You’ve got to work to work, not to die,” he repeated. He spoke about the coal miners at Upper Big Branch mine and how so many of them were his friends. The college will house the names of those who’ve died on the job and pay tribute to them each year. Without their courage and hard work, so many projects would never have been completed.